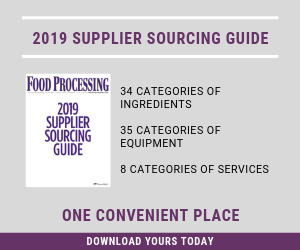 Our editors selected the following equipment products to feature in our June 2018 issue of Food Processing. See which products they chose. Eliminate product contamination from dust with the Lift and Seal Container Discharger. The unit accepts a container of material loaded at floor level and discharges the contents into an existing hopper. The Lift & Seal System seals the container to the stainless-steel pour hood for dust-tight discharge, eliminating product contamination. The pour hood includes an air actuated butterfly valve for material flow control. In addition, the unit features a continuously welded tubular steel frame, rigid conduit and hydraulic lines, and a carbon steel NEMA 4 control enclosure. The patent-pending Winsmith RD offers a fret-free motor connection that guarantees quick motor removal and replacement with a single lubricant level design. The RD is interchangeable with many competitors’ quill input, right-angle speed reducers. The RD features efficient gearing, a two-bearing worm support and the WinGuard 316 stainless epoxy coating system. Also available is the RD Max, which features a stainless-steel nameplate and output shaft, IP66 certification and X-ray and magnetically detectable food safety blue plugs. The Hygienic Conical Top (HCT) Cyclone fulfills the requirements for use in highly sanitary applications in industries such as food, pet food and beverage. They are capable of handling heavy dust loads and are good spark arrestors. They are suitable for applications where high moisture and high fat content are commonly used in equipment configurations that include dryers and coolers, coating drums for flavors, centrifuge exhausts and extruder negative airlift systems. Sanitary design minimizes internal and external horizontal surfaces where product or water may collect, and infinitely adjustable clamped connections have replaced bolted flanges. This improves installation versatility while eliminating hard to clean external harborage points. A tool-free clamped dome with a ferrule used for cleaning the riser tube and draw-through area simplifies maintenance. Unlike traditional mixers, the company’s ultra-light weight GMP sanitary mixer mounts directly on the Tri-clamp connection of both poly and stainless steel vessels. The hygienic agitators are typically used for tank volumes ranging from 5 to 500 liters and are said to provide complete dissolving of solids being added with 100 percent uniformity. Cleaning and sterilizing is simple via CIP spray balls in the tank, autoclaving or hand wipe down. Achieve the proper fill temperature for heated fillings with the company’s hot fill lines. Suitable for soups, sauces, stew, cheese, peanut butter as well as non-food applications like cosmetics and grease. Heat options include either insulated hoppers, jacketed and insulated hoppers which accept plant supplied hot water or self-contained hot oil heat systems with multi zone control to heat the entire filling flow path. The self-contained systems can maintain plus or minus one degree at temperatures up to 210°F. The DataMan 470 series fixed-mount barcode reader is said to deliver maximum coverage, speed and ease-of-use. It allows a greater field-of-view and depth-of-field coverage than conventional readers, decodes mixed symbols in varied locations while maintaining speed and reads low-contrast and ultra-small 1-D and 2-D codes not visible to other readers. The features enable faster and more efficient installation and operation. The Twin-Centerpost Bulk Bag Filler has XP controls and reduced height posts for low headroom applications. It is equipped with a manual fill head height adjustment to accommodate smaller bag sizes, pneumatically retractable bag hooks, an inflatable connector to seal the bag inlet spout and a feed chute outlet port for dust-free air displacement during filling. A NEMA 7/9 explosion-proof electrical system controls the automated vibratory densification/ deaeration deck which stabilizes the bag for storage and shipment. The dual post frame is a patented design that maximizes strength and improves accessibility to bag hooks while simplifying construction and reducing cost. A new line of air and water-cooled chillers brings precision temperature control and energy savings to a wide variety of batch, process, rolling and molding applications. The company’s water and air-cooled chillers are available from 1 to 30 tons and operate at a standard range of 0-80°F and are said to consume 30 to 50 percent less energy than fixed speed models. All portable chiller models offer adaptive controls with remote communication options and are Industry 4.0 ready. Industry 4.0 systems will incorporate transparent communication protocols and machine learning algorithms that can collect and analyze production data to improve efficiency, reduce maintenance requirements, support human activity and decentralize decision making. Fill hot and ambient-temperature viscous liquids with the Rapak Autokap 1900 series liquid filling equipment. Designed for bulk containers ranging from 30 gallons up to 1,000 liters, the filler is said to be ideal for pulpy juice, sauces or purees with particulate as large as 5/8-inch in size. The filler is equipped with a Micro Motion mass flowmeter that ensures precise fill weights during the fill process and a fill head raises and lowers the bag, allowing for efficient filling of the bag and surrounding container. The company says it has reduced the energy use of its separators by 40 percent by incorporating a pressure management technology, Encapt, into the systems’ design. This lowers the atmospheric pressure around the spinning bowl using a low-pressure pump, and the system is supervised by sensors that keep air friction minimal. Less friction means less energy required. An air-tight design inside the bowl, where the whole system is hermetically sealed, ensures no air enters. With the inlet at the bottom, and the outlet at the top, it saves the center for outlet flow, and requires less energy. Unibloc-Pump Inc. (uniblocpump.com), Marietta, Ga., has acquired R&H GmbH of Germany. The acquisition will be renamed Unibloc-Pump R&H GmbH. With Unibloc-Pump's Swedish sister company, Unibloc Pump AB, the merger makes the acquirer a market leader in Europe for road tanker pumps. Achieve low shear and gentle product handling for syrups and sauces for both high and low viscosity products with the TopLobe Plus Series hygienic rotary lobe pump. It provides reliable performance with low-noise, robust, consistent, smooth displacement of product using sizable fluid cavities that can accommodate large solids in the product flow. A rotor-shaft attachment ensures accurate rotor positioning and backlash-free connection, while the gear case design ensures no cross-contamination of lubricating oils into the product zone. The TLP pump is suitable for horizontal or vertical mounting, capable of bi-directional flow and has a four-way mounting gear case. Detect high and low levels while protecting valuable inventory with the company’s rotary level indicators. Rotaries are a simple, cost-effective point level measurement system that can be customized to meet the needs of your operation. A new line of rotary options recently was introduced, including the Maxima, BMRX and mini-rotary products. All come with custom extensions, paddles and mounting options.